It really depends on individual. My eldest started at 8yrs. She's 17 now and plays of a 2 h'cap. My second started at 5yrs but she stopped when as she was "uncooperative" (cannot take instructions). We restarted her at 7yrs. She's 13 now and plays of a 4 h'cap. My youngest started at 3.5 yrs old. He's now 9 and plays of a 20 h'cap. I taught them the basic and from their, they started their training in Thailand to play competitively. We travel there 4-5 times a year. On a day to day basis we have online video lesson. Happy New Year Everyone. As we step into 2017, a new year and another fresh start. I am excited for what this year has to bring and as I start planning, I also started reflecting about the golf industry, my career as a golf coach and endless opportunities about the very thing I love doing. I started to look at pictures and videos of the wonderful kids I coach. I started to think and plan. 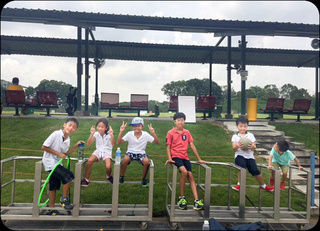 As I also look in the golfing scene here in Singapore. I asked myself this question, does the future in golf seem bleak or does it seem bright? Especially for the upcoming and younger generation. Golf has been in my life for the past 20 years. Looking up at great golfing legends like Tiger Woods and as I am Malaysian, our awesome Danny Chia or Thailand’s back to back winner Thongchai Jaidee at the Carlsberg Malaysia Open 2004,2005. A person I wish to highlight is Singapore’s own legend Mardan Mamat, who is one of the top ranked player in the Asian Tour and has countless winnings in Asia. However, over the years, golf has become more competitive and life has gotten more demanding due to the economy. Also with a number of courses in Singapore that are going to close down due to the infrastructural development in this country. Despite the challenges we foresee, from my Coaching standpoint and even though it seems that golf in Singapore is slowing down, I do believe that Singapore will produce more champions in the future, as well as for Malaysia and Asia. I believe we humans can go very far when we put our heart into it. For me, I have the privilege to coach juniors as young as 2 years old and I have not lost hope although it’s always hard and rare to find talents but I will never stop believing hard work can over take that. I am definitely optimistic and I love this game called Golf. I have always been excited about this sport and sharing my love on this game to parents. I would highlight that, not only is it a good sport for exercise that shapes a person’s character. It is definitely a sport that plays a part in imparting values in one’s life. It is a great game to introduce to your child or start this game yourself, it has so many benefits and a life long game that will follow you for a long time. Lastly, in whatever we do, never give up and keep dreaming high. "Shane has always been an extremely active child and he can never focus on any single activity until he found golf. He can practice on his swings and putting for up to 2 hours at a stretch which is quite an achievement for his age. There are also other improvements we saw, his strength and coordination. So we definitely would love for him to continue taking this sport! "